Dressing up for school can be an enjoyable experience for little girls. It can also be an everyday challenge! Not knowing what to wear or worrying about showing up to school in the same outfit can be a common problem. 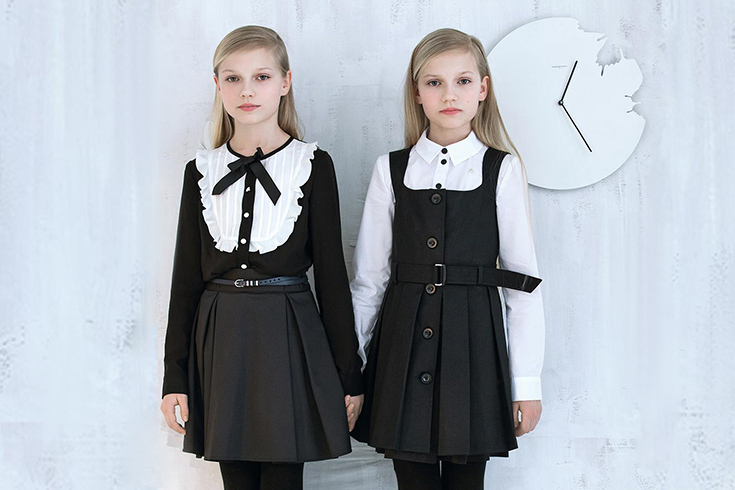 Papilio created a fashion line of school outfits for little girls. The School collection features an upscale array of blouses, skirts, pants, sweaters and dresses that will give your little one a stylish look from Monday to Friday. If your little girl likes wearing dresses to school, this classy dress, blouse and vest in solid colors make a fun school uniform. Your daughter will feel all grown up in this knee-length gray dress with a collared T-shirt underneath! Dresses and skirts might not be every girl’s style; the School collection offers a selection of pants for equally dashing looks. Throw in some color to your girl’s school wardrobe with this red-checkered kilt and smart looking wool button-up blazer. It will be perfect for this spring! Last but not least, one of our top picks from the School collection! This grey pleated skirt paired with a black long sleeved collared blouse will definitely make your little girl look sophisticated! Papilio classy outfits for girls can be worn any season because of their versatility and basic colors. Have fun mixing and matching different items for each day of the week! For example, a wool button up blazer looks great with a pleated skirt, it will also work well with any pair of pants or over a solid colored dress. Whatever you little girl’s style and preference, Papilio Kids School collection is sure to have many trendy outfits to make school shopping an enjoyable bonding experience for both mothers and daughters!